If you missed any of the previous installments in our series about Paul's missionary journeys, get the back issues below. Or take advantage of our special offer: subscribe, and you'll get the whole series for free! 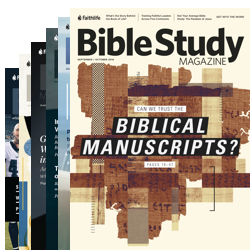 Get all four installments of the On the Road with Paul series when you purchase the July/August 2017, November/December 2017, March/April 2018, and July/August 2018 issues. Part one covers Paul's first missionary journey, and includes insights from scholars like Eckhard Schnabel and Timothy Gombis. In part two you'll learn about Paul's second missionary journey from James Thompson, Caryn Reeder and others. Track Paul’s third missionary journey in part three, with E. Randolph Richards, and Lynn M. Cohick. * Free shipping applies to US orders only.